1 Comments Published by Jane on Tuesday, March 10, 2009 at 7:59 PM. You may recall that Thomas McDonough (my great-grandfather) obituary revealed that he had siblings. One of whom was named Bartholomew. I was able to locate Bartholomew's grave in Worcester. Unfortunately I was stopped at that point. You would think a name like Bartholomew McDonough would be fairly unique. I had hoped that uniqueness would help me locate a Naturalization record for him. Bartholomew Joseph McDonough born 1887 in Sligo, Ireland. Now this Bartholomew can't possibly be the brother of Thomas - he is far too young. But could he be a nephew? Jane: This Bartholomew is indeed my "Uncle Bartley." 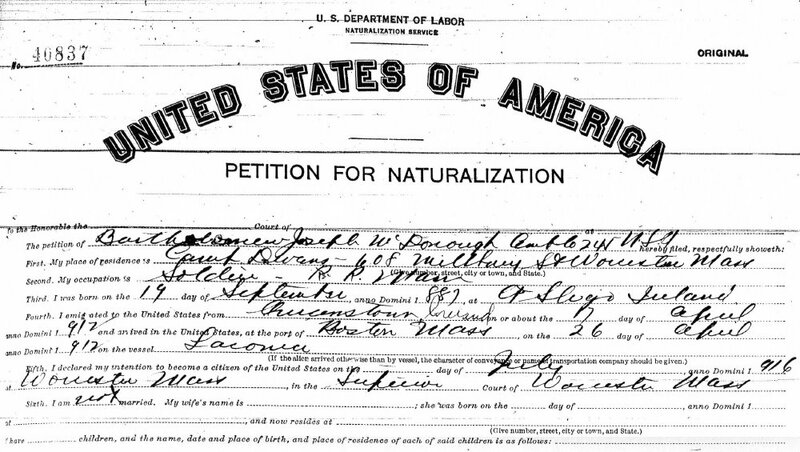 I have a copy of his WWI draft registration card, indicating that he was born September 19, 1887. He was my grandfather Patrick's brother. It appears that you may be looking at a generation before my grandfather's, which makes sense, as I believe that Thomas McDonough was here well before my grandfather Patrick arrived. I'm not sure if Thomas was a cousin, uncle, or other relation, but it appears unlikely that he was a sibling, unless I misunderstand the dates.